Once you've clicked 'List' you'll be directed to the first step. If you are not directed to the first step, you'll be taken to our log in or registration page. You need to make sure you're logged in before you try to list a venue. Your venue's location is the first thing we'll ask for! Select a country and a city from the drop down menus. Enter the name of your venue and then select from the available categories by clicking in the empty category box. You may select up to five. Finally, enter some introductory information about your business. 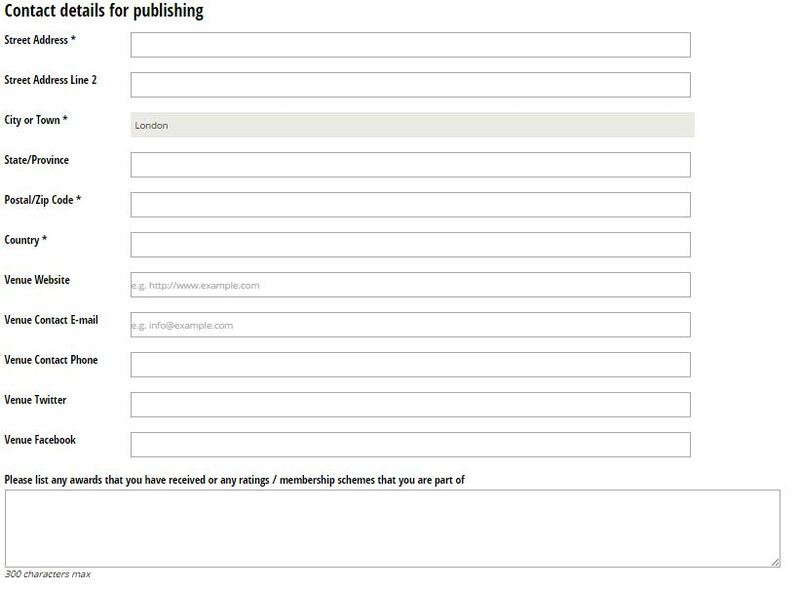 The contact details for publishing are what people looking at your listing can use to contact you. Information highlighted with an asterisk (*) is essential. You will also have the chance to add any awards that your venue has acquired here. The main contact information section is not published on the website. This is for our use only in case we need to contact you regarding your listing. This information is essential. Tell us about your venue! 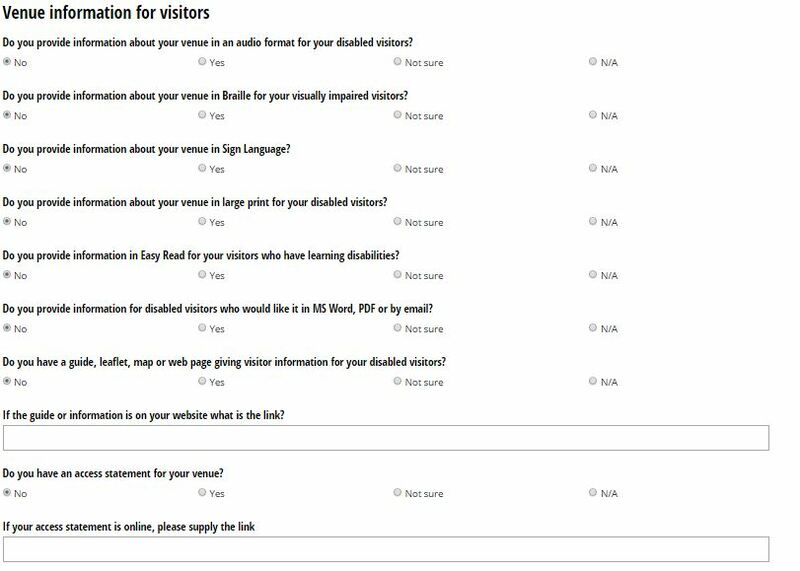 This is where you can start to get a little more detailed about your venue's accessibility. We will ask you questions step by step and provide example answers to give you some inspiration. The more detail the better! 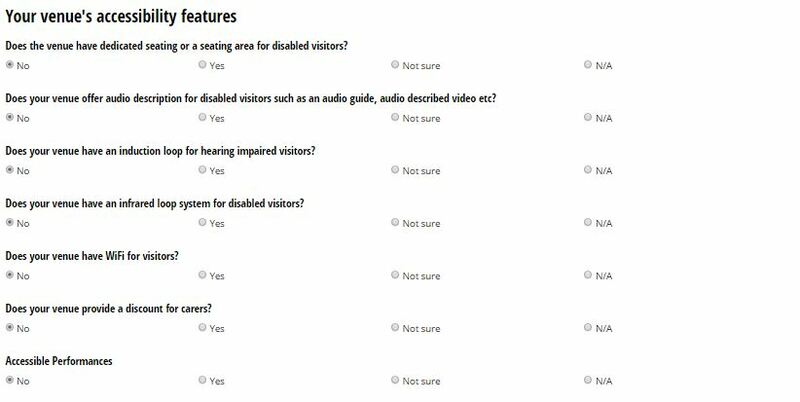 This section appears on the website as coloured check boxes so that readers can quickly glance at what your accessibility is like. The information you provide here will show up as a list of features and check boxes. This is one of the most important steps. A venue cannot be listed if you do not add pictures. Try to include a photograph showing your venue overall, preferably from the outside. Other good photos to include are photos of your accessible toilet if you have one, photos of entrances, and a photo of the layout of your venue's interior if applicable. A few last things to check off, and you're done! Please tell us where you found out about us. 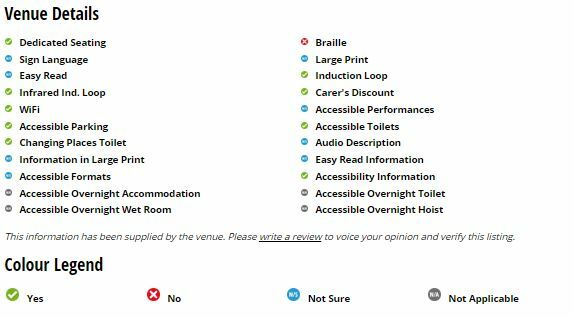 It helps us to make sure that more venues can find us and list their disabled access information. Once you've done this, you simply need to confirm that all of the photos belong to you and that you have read our Terms and Conditions.